The students of Peer Educators Club & Interact Club of The Indian Heights School, Sector 23, Dwarka generated awareness amongst the students about Cyber Bullying. on May 13, 2015. During a special assembly students performed a skit and apprised the students about the ill effects of social networking sites. 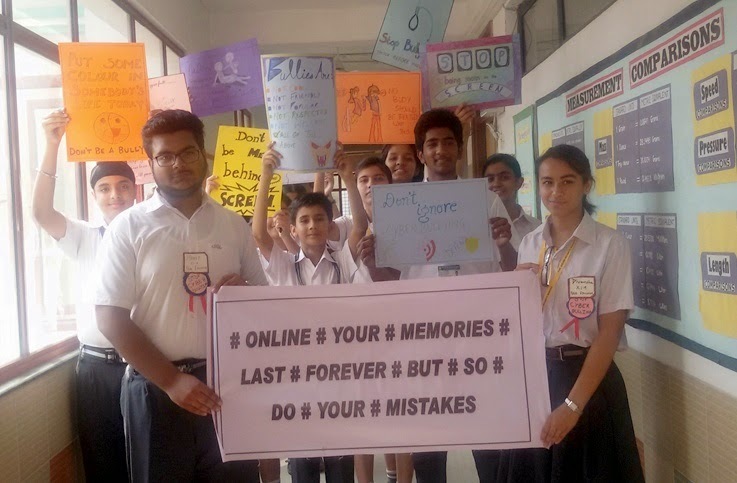 Students also visited class rooms, holding banners and meaningful placards and had an interactive discussion as how ignorance can lead to serious consequences , thereby creating awareness about Cyber Bullying. As a part of this awareness campaign, the School Counselor along with 25 students also visited the neighboring schools like Paramount International School and Delhi International School on May 14,2015 where they performed the skit. This was followed by an interactive session where students raised queries and were acquainted about the Do’s and Don’ts of using social media websites The efforts put up by the students of The Indian Heights School motivated and highly appreciated by one and all. Principals of both the schools congratulated the students of The Indian Heights School for their endeavour to sensitize the young generation on a sensitive topic like Cyber Bullying. To conclude it was a fruitful day with rich learning experience for everyone involved.